Come on ride that train. I’m hopping back on a lot of trains this week. March was ridiculously busy and a palm full of promises I made to myself apparently got packed away in boxes. Can someone locate that box called “Self-improvement strategies”? Thanks. Or maybe I left them in California, with the Hermonistas? Either way, I’ve been slovenly and lazy and an all around mess. Do not offer me grace. “But you moved, Annie, and it’s been stressful. No worries.” Whatever. I still could have graded papers and cleaned out my car and paid my bills and treated my body well. I am a creature of habit, a person who needs to be settled to be healthy. To be disciplined. To be a good citizen of my home, my classroom, my body. Now that I am settled-ish, it’s my choice to squelch the laziness. So this wannabe hobo loaded up her red bandanna and spied some old familiar trains headed my way. And I’m jumping on. Train #1: I missed, literally, almost the entire month of March in my chronological Bible that Shannon and I are reading. Last night, I pulled it out of the depths of whateverness that is still piled at the end of my bed. And I read April 1. Train #2: I stayed at school an extra two hours [people were concerned- why is Annie still here?] to grade papers and plan ahead. Unusual for me, apparently pretty normal for other dedicated educators. So there’s that. Train #3: I was behind in my Beth Moore Bible study, but I’m all caught up now. Ish. I went back to Brooke’s house last night for the Week 4 session and it was oh so good. Train #4: I don’t blog about this train [it’s in that tiny category of things I won’t blog about], but she does, and so does she. So that’s a train I’m on and I probably won’t talk about it again. Sorry. Train #5: I finally see time in my schedule and space in my head to write something besides a blog. Which is good, since I’m quitting my job and all. You know, it is a true statement that if you want to be a writer, you have to actually write. You can quote me on that. The hobo in this picture did a fine job jumping himself. But were it not for his fellow hobos pulling from the inside, he would never make it in the car. So. I’m asking. Pull me on, Molly, Haley, breakfast club girls. Pull me on, Shannon. Pull me on, Sarah. Pull me on, Tracy L., Kathryn, Lisa, Jenn, and the girls at school. Pull me on, Hermonistas. Pull me on, Beth Moore. Pull me on, Kathleen. Pull me on, family with whom I now reside full time. Pull me on. 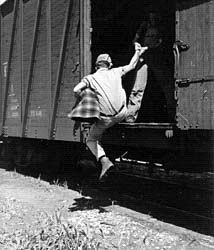 Pull me on to the train that takes me to Who-I-Want-To-Be, USA. It’s a great little city. And I want to move there.